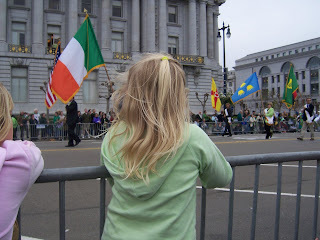 Over the weekend we spent a day at the San Francisco Saint Patrick’s Day parade. This is something we did regularly in our earlier years during and after college. A good friend from college, Mike Murphy (Murph), is VERY Irish and for the past 35 years his family has had a day of Irish Soda Bread baking. This event was so popular that they were often written up in Herb Caen’s column in the SF Chronicle and they rented a hall to accommodate all the people. Murph’s family always planned this wonderful event on the Saturday before the parade that is normally held on Sunday. Our weekend would begin bright and early Saturday morning with a shot of Irish whiskey, a prayer and the singing of Danny Boy by Papa Murph. Then the fun would really begin, any new people to the event were considered virgins and they were expected to make the bread… a few hundred loaves of bread! Now this may sound fun, but the truth is it’s more fun to watch because mixing hundreds of pounds of flour, sugar, butter, etc. and then having gallons of buttermilk poured over your head, really is not that great. The batter feels like concrete and getting it out of your hair takes days. As the loaves baked hundreds of people would sing and dance and eat and drink. Really a wonderful event! The Murphy family would give away awards, the best one in particular was called the “I did it for the Bread” award and was given to the person from the previous year who did the craziest thing for the bread… of course this usually was terribly embarrassing for the winner because it always involved doing something really stupid. The party would last until all hours of the night and everyone left with a loaf of Irish Soda bread. The next morning we would all get up and head to downtown San Francisco for the Annual St. Paddy’s day parade. In college we would ride on our college’s float and after college we would ride on the Murphy’s family cable car. It was such a wonderful weekend filled with lots of Irish tradition, lots of Irish beer and many, many wonderful memories. Fast forward 10 years, all of our college friends now have kids and the Murphy family has scaled back the event to just include children. Three years ago Dylan helped mix the bread, but only about 50 loaves were made. The event no longer includes all day binge drinking because we all have young kids who need our attention. And we haven’t been to the parade for years. Last weekend we made a plan with the old crew because the parade was going to actually fall on St. Patrick’s Day and we all met up in the city for the parade. We packed chairs, snacks, juice and all the kids. We arrived early for prime seating and parade viewing. All went really well. Then Dylan had a big surprise. 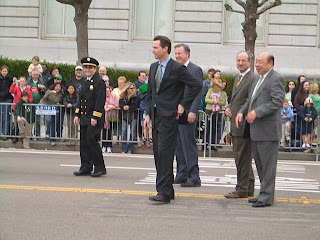 SF Mayor Gavin Newson who was marching in the parade made a beeline right for her. He asked for candy… she freaked out and tried to hide from him. He put on a big show for the crowd's benefit and she stayed hidden. As he walked away, he said he would be back. About ten minutes later he did come back, with money. 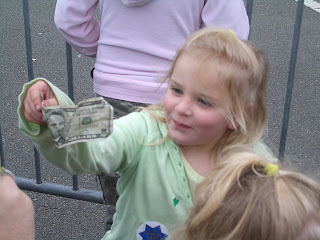 He walked right up to Dylan and when she tried to hide he coaxed her back and offered her a five dollar bill. She ripped it out of his hand and ran back to her hiding spot. The crown went wild! We laughed and cheered for Dylan. And Gavin Newsom was a great sport. Our weekend was fun, we didn’t have a hangover and we can’t wait to go again next year… we even talked about getting our own float to ride in the parade! and the guys around him are laughing because Dylan has gone into hiding again! Oh my gosh....that is just the best. I love the tradtions you share with your friends and isn't it funny to realize how much life has changed. I'm so glad you were able to spend the weekend in the city with old friends. Great photos! That is really cool. I remember a drinking game that sounded like your early days and ended up with a horse drawn in Sharpie marker on my husband's back.